This update extends the Key Management Service (KMS) for Windows Vista, Windows Server 2008, Windows 7, Windows Server 2008 R2, Windows 8, and Windows Server 2012 to enable the enterprise licensing of Windows 8.1 and Windows Server 2012 R2. KMS uses a KMS host key to activate itself on a KMS host and to establish a local activation service in your environment. This update extends support for KMS to provide activation for Windows 8.1 and for Windows Server 2012 R2. This update extends the Key Management Service (KMS) for Windows 7 and Windows Server 2008 R2 to allow enterprise licensing of Windows 8 and of Windows Server 2012. Key Management Service (KMS) uses a KMS host key to activate KMS on a KMS host, and to establish a local activation service in your environment. This update extends support for KMS to provide activation for Windows 8 and for Windows Server 2012. Before you start you must al ready have a kms server. 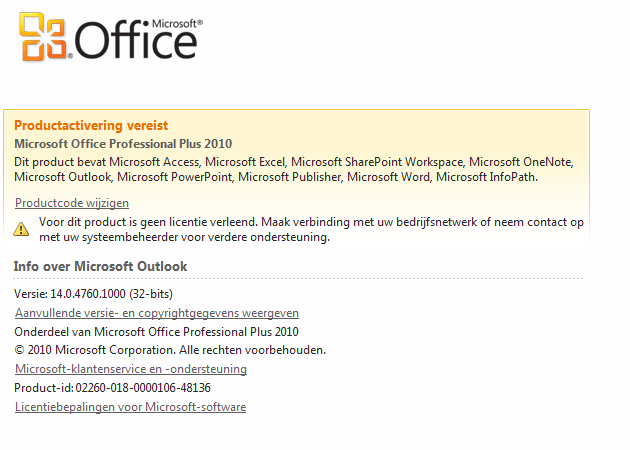 On the KMS server you need to install the Office 2010 KMS Host License Pack on the KMS Server. Click to the File tab. Click Help. Click the start menu and enter cmd /k cscript “%programfiles%\Microsoft Office\Office14\ospp.vbs” /dstatus in the search box. If running 32 bit Office 2010 on 64 bit Windows, %programfiles% above should be replaced with %programfiles(x86)%. To check if a DNS domain is configured for KMS auto-discovery, check that a SRV record exists. If a SRV record exists for the domain, the DNS server will detail the SRV record. KMS activation requires that the machine to be activated has TCP port 1688 open for outbound communication to the activation server. Download and install the utility portqry.exe from Microsoft. It is a command line utility from Microsoft that reports the port status of a remote host. 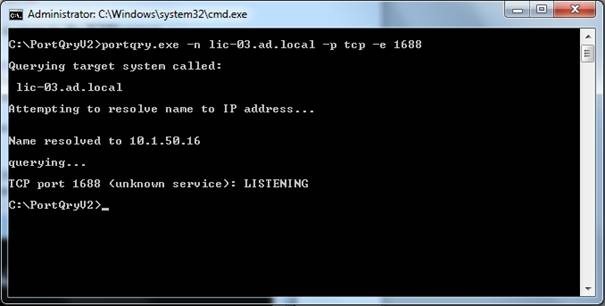 The command will return “TCP port 1688 (unknown service): LISTENING” if the computer is able to communicate with the KMS server. 1. Type cmd in the search bar to locate the command window..
2. At the command prompt, type cd\Program Files\Microsoft Office\Office14. 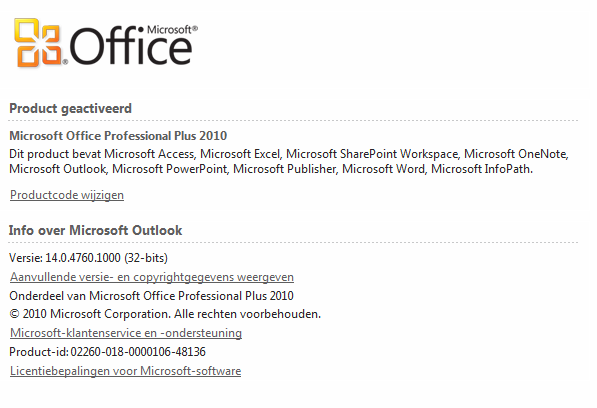 If running 32 bit Office 2010 on 64 bit Windows, Program Files above should be replaced with Program Files (x86). Run the command cscript ospp.vbs /sethst:ward-dc02.wardvissers.local to manually specify the KMS activation server. 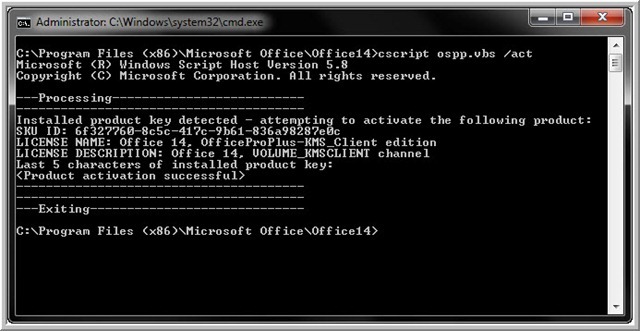 Run the command cscript ospp.vbs /act to activate Office with the KMS server.